Although the classic Provençal dish ratatouille is especially good in the summer when the required vegetables are at their peak, making it with canned tomatoes in the cooler months and serving it over polenta with freshly grated Parmesan cheese is nothing to scoff at. In a large sauté pan or pot, heat enough olive oil to coat the bottom of the pan. Add the onion and sauté over medium heat for 5 minutes, until soft. Add the eggplant and peppers — and another glug of olive oil — and sauté about 10 minutes, until the vegetables are just tender. Add the zucchini, garlic, tomatoes, red pepper flakes, and bay leaf and bring to a simmer. Stew for about 20 minutes, until everything is cooked through, then remove the bay leaf. Just before serving add chopped basil or parsley, and season to taste with salt and pepper. 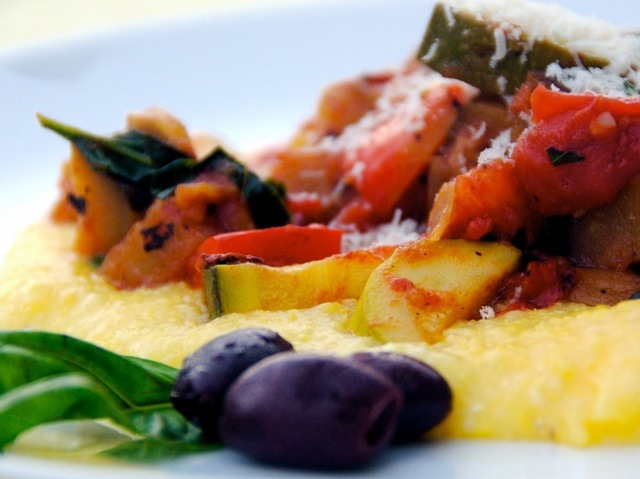 To serve, spread a ladleful of polenta on each plate, spoon over the ratatouille, and top with grated Parmesan.